When it comes to exercise, people tend to emphasize on just using weights. While it's important to use regular weights, you need to incorporate a few kettle bell presses. Unlike using weights, kettle bell presses improve your whole body. In this post, we'll show you how to exercise correctly with kettle press. Using kettle bells can be dangerous if there's no form. Our primary purpose is to teach you proper kettle press exercises so that you can get back in shape. Kettle bell movements are a simple exercise that's often used by beginners. When doing the kettlebell clean, you are training not only your upper body but your lower body as well. We suggest doing this exercise if you need to get started in your exercise routine. To do this clean, you'll have to start backward. You'll have to grab the kettlebell in your hand. Then, you'll have to grasp the kettle bell and place your first hand with your other hand. After that, you'll have to curl the bell towards your chest. Remove your free hand and become comfortable in this position. The elbow should be tucked to the side of your chest. It should look as if you're trying to hold a newspaper between your ribs and your upper arms. The forearm should be at an angle that's slight across your chest. Also, you'll want to place the bell handle parallel to your callus line. This is because we are only concerned about making cleans, not positioning for benching or jerks. We recommend that you do three sets of 8 repetitions when doing the kettlebell clean. The kettlebell push press is proven to increase your endurance, build muscle, and burn fat. It improves your triceps, traps, and shoulders. In fact, it also develops the lower body. Doing this exercise will grant you extra strength, stability, and balance. To do a kettlebell push press, first, hold the kettlebell and place it towards your shoulder. Next, bend the knees making sure that your torso is completely straight. Then, drive your heels in the opposite direction to create momentum. While doing this, keep your arms extended and press your kettlebell towards the lockout position placed on your head. Lastly, lower the kettlebell then return to your starting position. Repeat this rep for at least six times. It's suggested that you do at least three sets of 6 reps to get a complete upper body workout. The kettlebell bench press is the result of a popular workou﻿﻿t being introduced in the world of kettlebell workouts. No exercise is widely discussed in the bench press. The most common question you'll hear in physical training is "How much can you bench press?" Hold a pair of kettlebells in each arm. Place them both in a locked arm position. Lower them slowly until they are placed to the sides of your chest. It should be a few centimeters away from the rib cage. Move the kettlebells back into the locked position. If you're starting off, you should do five sets of 5 repetitions of this exercise. Since it's a bench press, you'll want to keep it at this frequency so that you train your muscles to grow. Make sure to practice proper form to prevent any injuries when doing the kettle bell bench press. Conclusively, we believe that doing kettle bell presses will improve your health. They are proven to remove fat and increase muscle faster than traditional weights. When going to the gym, make sure that you have a few kettle bell exercises in mind! If you have any questions in regards to the exercises, leave a comment below. Also, if you have any experience with kettle bells, please tell us your story! Improve Your Cardio, Strenght, And Flexibility! 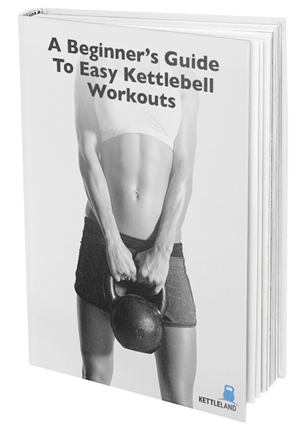 Download our FREE eBook guide and learn how kettlebell workout can help you with achieving your fitness goals! Smart Kettlebells: Are They a Thing? Improve Your Cardio, Strenght And Flexibility!